We need you! It concerns each one of us! We managed to get a great program together and now we need you! With our symposium “Mensch-Sein mit Algorithmen/ Being Human with Algorithms” we address key topics of today’s discussion on the Digital Transformation, including Artificial Intelligence, Algorithm Ethics, Big Data, Internet of Things, Autonomous Driving, Social Responsibility, Robot Assisted Living, Industry 4.0, Privacy. It is highly relevant that we as society discuss about these topics now! It is our future. We have to shape it or others will do so. Feel free to share the announcement poster on the right, print it, pin it at your institution, company, club, etc. THANK YOU! We hope to see you on September 20th and 21st in Heidelberg! p.s. : You can also use our logos in your announcements! Symposium logo as PDF and SVG. 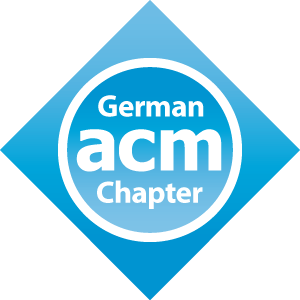 ACM German Chapter of the ACM logo as PDF and SVG. 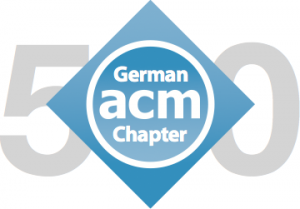 50 years German chapter of the ACM logo as PDF and SVG. The Digital Transformation is unstoppable. We interact with algorithms every day – voluntarily and involuntarily. In our blog an in the real world we want to shape the Digital Transformation together with you! 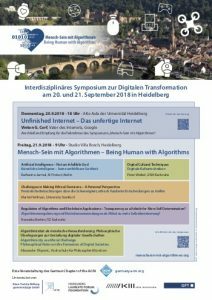 We cordially invite you to our symposium “Mensch-Sein mit Algorithmen/ Being Human with Algorithms”! Until July 31, 2018 you can apply for free tickets sponsored by the CECL!